A jazzed up version of this story has moved here. Living the expat life, I’m always curious about my new, foreign environment, but I’m not much of a tourist. I’m not one to go sight seeing and looking at ruins or temples or museums. (Although when my mate and I were in Egypt on vacation, that’s what we did, of course, right along with getting suckered into entering perfume shops, just like every other tourist.) What I do like is to walk the streets in foreign towns and villages and look at people. I like markets. Big markets, crowded markets, dirty markets. Lots of stuff, food, animals. Lots of people. Streets and markets are where you see real life, not relics and memories of life that’s been dead for centuries. The Old City of Jerusalem is one of these places, especially the Muslim Quarter, which is very old but very much alive. When we lived in Ramallah, Palestine, where my spouse worked on an American foreign aid project, I would on occasion hitch a ride into Jerusalem with him and spend a couple of hours exploring the Old City. Here’s the tale of one of my wanderings in the souk, seeing real life — the old, and the new. 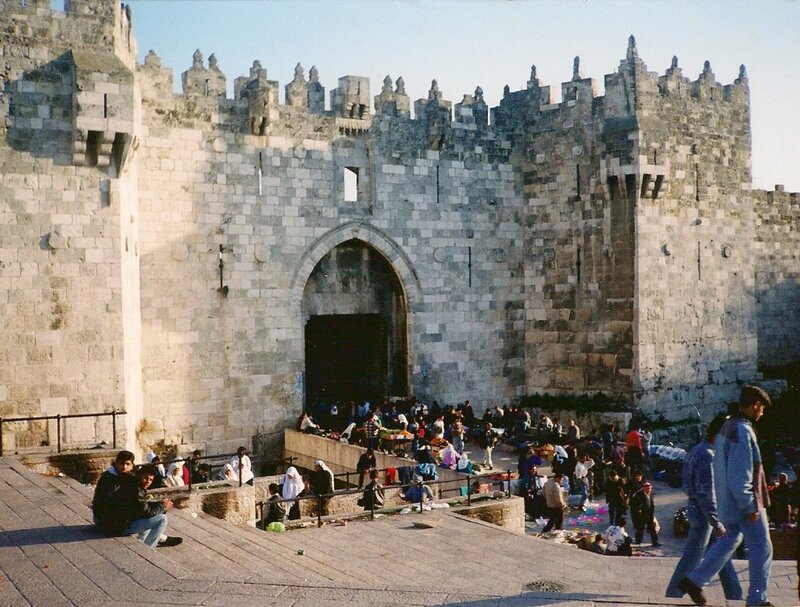 The photo is of the Damascus Gate, which leads you straight into the Muslim Quarter.